On this page you can find a link to a summary of most of the principle European Directives and Regulations. The list on the right is separated into Conformance Specialisms and Other Directives. Conformance has specialist knowledge, experience and expertise in a number of directives and reguations as indicated. The Other Directive pages are a summary of the requirements and have been created to provide you with relevant information and useful links, however we do not currently offer advice on these directives. The CE marking Directives are documents published by the European Commission that lay out the protection requirements (design safety) and the administrative requirements for products intended to be manufactured or imported into the EU. There are many Directives, covering a large range of products, but they all essentially contain these two distinct sets of requirements. However, the directives do not state how the requirements are to be specifically and quantifiably achieved. This task is left to each individual EU member state to implement into their own national laws. This, in turn, is the role of the standards. Various multinational committees meet to produce and update standards relating the safety, marking, design etc of products within their fields. These standards are implemented at national, European or international level and some are ultimately adopted by the member state governments to specify the requirements of the Directives. When a standard has been referenced by the European Commission (by publication in the Official Journal of the EU), it can be adopted by a member state as a yardstick to use for product compliance. In this situation a product which complies with the approved standards for a given Directive can be presumed to comply with the essential requirements of the Directive. For a full list of the CE marking (and some non-CE marking) Directives, see our detailed directives pages. For more information about standards, see our detailed standards page. 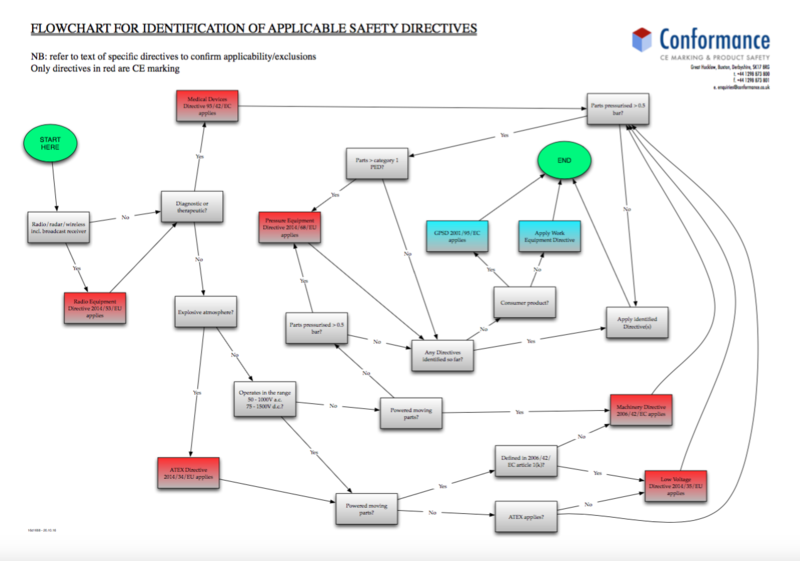 Many of our customers find this flowchart useful as a starting point to identify the safety directives applicable to their product. On March 29, 2014, the European Commission published the recasts of eight CE marking directives. These directives have new reference numbers and are aligned with the rules and responsibilities for CE marking that were published earlier in the NLF's defining document Decision 768/2008/EU. These Directives came into force on 20th of April 2016 as part of a ongoing alignment of all the CE marking directives. The introduction of the ‘New Approach‘ framework to European directives in the 1980s was intended to restrict the content of the directives to essential requirements and for harmonised standards to provide the technical details. To improve the acceptability of these directives across the EU, the European Council adopted a resolution for a 'Global Approach' which laid down general guidelines and procedures for conformity assessment. To further improve the internal market for goods and strengthen the conditions for placing a wide range of products on the EU Market a further review of the Global Approach resulted in a package of measures known as the 'New Legislative Framework'. This was adopted in July 2008 and came into force in January 2010. The Radio and Telecommunications Terminal Equipment Directive (R&TTE) was replaced by the Radio Equipment Directive (RED) on 13th June 2016. The majority of the differences introduced by the updated directives are concerned with implementing the principles of the NLF, but the legislators also took the opportunity to update some of the technical details of the affected directives. Generally, these changes are intended as clarifications and there are no fundamental changes to the scope or requirements of the directives. (Details of the technical changes and the implementation dates can be found on the relevant directive page elsewhere on this site). The New Legislative Framework creates common responsibilities across all of the new directives for 'Economic Operators' (i.e. manufacturers, authorised representatives, importers and distributors) responsible for placing goods on the market and specifies their responsibilities. *Note that under the definition of 'manufacturer', if you own brand label products you will effectively become the manufacturer and acquire all the associated responsibilities under the applicable directives. As already noted, for most of the recast Directives that have been aligned with the NLF, there are no real changes for manufacturers who are already properly CE marking their products and the process is pretty much the same as under the old Directives, providing that they follow the general principles as set out in Article 30 of Regulation (EC) No 765/2008. However, for importers and distributors, there are new obligations which they must comply with. Ensure product meet the essential safety objectives. Create a Technical File and follow the relevant conformity assessment procedure. Keep the Technical File and Declaration of Conformity for 10 years. Have quality procedures in place to ensure consistency of manufacture and to maintain of conformity with the directive(s). The procedures must cover changes in production, components, standards etc. Carry out sample testing where this is considered appropriate to the risk presented by the equipment. Investigate and log non-conforming product, complaints, recalls and inform distributors of such monitoring. Apply marking that must include type, batch or serial no. or other means of unique identification, registered name or trademark and postal address. Provide instructions, safety information and labelling which is in suitable, clearly understood, intelligible form and translated into the language(s) of the country of sale. Manufacturers are encouraged to include a web address but must not rely on on-line resources for the delivery of safety related information. Be able to supply details of suppliers and customers upon reasonable request by an enforcement authority. Records must be kept for 10 years after supply or sale. Take immediate action to correct, withdraw or recall non-conforming product. Product Recall checklist. Inform the relevant national authority if the non-conforming product presents a risk. Provide information or documentation in paper or electronic form if requested. Co-operate with authorities on any action to eliminate the risks posed by CE marked equipment which they have placed on the market. Ensure the manufacturer has followed the correct and appropriate conformity assessment procedure, has drawn up technical documentation, affixed the CE mark, provided any necessary instructions and safety information and applied the correct marking. Not place non-conforming product on the market, and inform the manufacturer and the relevant national authority if non-conforming product presents a risk. Indicate on the equipment their name, registered trade name or registered trade mark and the postal address at which they can be contacted or, where that is not possible, on its packaging or in a document accompanying the equipment. The contact details must be in an easily understood language(s). Ensure instructions, safety information and labelling is provided in a form which is in suitable, clearly understood and translated into the language(s) of the country of sale. Ensure that storage and transport conditions do not jeopardise conformity of the equipment. Carry out sample testing where considered appropriate to the risk presented by the equipment, keep a register of complaints and recalls and keep distributors informed about these activities. Be able to supply details of suppliers and customers upon reasonable request. Keep copies of the equipment’s Declaration of Conformity and ensure that this and the manufacturer’s technical file can be made available to the relevant enforcement authorities for 10 years after the last date on which the product is sold. Co-operate with authorities on any action to eliminate the risks posed by equipment which they have placed on the market. Verify that the equipment bears the CE marking and is accompanied by the required instructions, marking (including identification of the manufacturer and/or importer) and safety information, in the correct language(s). Not place non conforming product on the market, and inform the relevant national authorities if non conforming product in their possession presents a risk. Take any corrective action required to ensure that non-conforming product which they have sold is made to conform, or where appropriate to recall or withdraw it from the market. Immediately inform the relevant national authority if the non-conforming product presents a risk. The NLF also has requirements for Notified Bodies, Notifying Authorities and Enforcement Authorities. This summary is designed to provide you with a general overview of the topic. If you require any further help or guidance please contact us.